I am the worlds worst at buying fruits and vegetables and then not using them or not using them all and then they end up in the bin! I really want to eat salad but when I'm tired its much easier to grab a bag of frozen veges than it is to clean, peel and chop. In an effort to really reduce my food waste I have been learning how I can prepare and store foods in advance so that it is easier to use them in cooking and meal preparation. I purchased a salad spinner from Stevens.co.nz when it was on sale and I am now a convert to such wonderful gadgets! Chop up your salad leaves and any other hardy ingredients that need washed (I sliced up some cucumber and capsicum) and pop them in the basket. Next add some cold water, attach the lid and give it a spin - this will give the salad a good wash. Once you are happy that its washed (or you want to change the water) drain the water out - this spinner has holes on top to do this without having to remove the lid. Then spin the salad again to dry off and once dry put salad into a zip lock bag - add any other ingredients like tomato wedges and then seal the bag removing as much air as you can. So now you have salad for the week, but it's not the most exciting lunch on it's own. Did you know you can freeze cheese? This has revolutionised my shopping as I can now buy bigger blocks of cheese and buy multiples when they are on sale and put them in the freezer. I cut the bigger blocks into smaller blocks that I would use in a week and often I put a whole block through the food processor to grate it before putting into a ziploc bag and then the freezer. Now I'm sure I'm not the first person to think of this but I had a brainwave to make a whole loaf of cheese sandwiches and then freeze them to be made into cheese toasties. I can get 11 cheese toasties out of a loaf of bread. 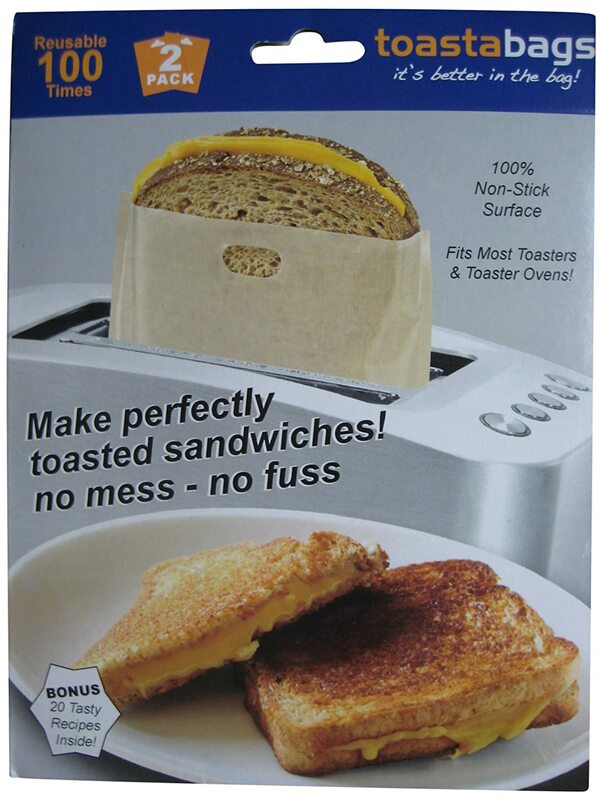 If you don't have a sandwich press toaster bags do the same job. 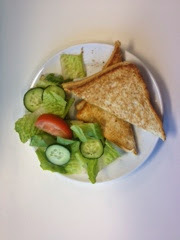 So easy, fast and cheap too: a tasty cheese toastie with a nice side salad. I had a lovely Easter weekend with my hubby and accomplished everything I wanted to. The weather was horrid with torrential rain from ex-cyclone Ita. Although there was a lot of rain, it was still quite warm too. Thankfully it had cleared up in the afternoon and it was quite sunny again when we went to our ice skating lesson - the last one of this term. I got to test out my new skates and my instructor was very impressed that I had got such new skates for a bargain price. I got my skates on trademe and they had only been worn about twice. My first steps on the ice with my new skates were marvelous! But after a short time they began to feel a bit tight around the width of my foot. I had previously baked my skates in the oven and I think that really helped since I didn't have any issues around the ankles and at the end of the lesson I didn't have any blisters but I think it will take a few more wears before they stretch out more at the toes. Before my next skate I think I will make 2 rice bags, heat them in the microwave and put them in my skates to see if heating them before wear will help. We had a relaxed day spending lots of time together then in the evening we went to the Easter Show. 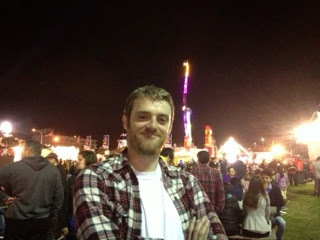 I had been really looking forward to the carnival and wanted to go into the Haunted House and then eat a toffee apple. 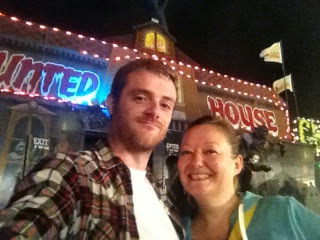 We had a look around and watched people playing some of the side show games then we went into the haunted house it was not so scary but it was fun. One of things I had been really looking forward to was a toffee apple! I had been craving one for weeks. The first stall I went to was all sold out! I panicked, but thankfully we found another stall that had them and I was a very happy bunny :) I munched on that while we wandered around the arts and craft stalls and then into the farm animals section. We saw some lovely animals and some super cute yellow chicks and ducks. We saw some Alpacas but since I was eating I didn't pet any of the animals. There were some spinning wheels and a stall selling alpaca yarn and goods. We passed the main stage and decided to have a go on a ghost train - the imagery and strobe lighting made for a thrilling experience and I was keen to give the other ghost train a go to see how it compared. We made our way to the other one via the market place where I very nearly bought a Maple Leafs hockey jersey. The second ghost train was a much better ride with bumps and jolts but didn't have as scary imagery as the first one but the spray of water took us by surprise at the end and we exited laughing and wiping water from our faces. By this time the fireworks were about due so we took a seat on the grass and watched the fire dancers on the stage before the sky was light up in a lovely display. A perfect end to a perfect day. The day was mostly spent pottering around before heading out to Waikaraka speedway for the Easter Spectacular. 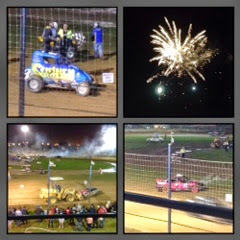 We watched midgets, sprints, super stocks, super saloons and derby cars. The different types of race cars were really interesting and some of the races were closely contended. Then there was a big fireworks display before ending with the demolition derby. 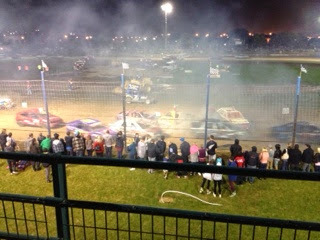 The demolition derby was really funny as car after car packed in, it did have to stop part way through so that a car on fire could be dealt with but then it was back to the action. 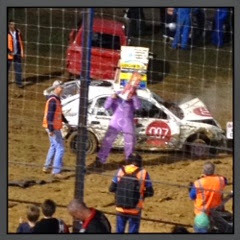 At the end, the winner got out of his car to receive his trophy and was wearing a purple onesie - it made me laugh! I managed to get my game on a little bit on Sunday before it was time to be social and we went to a friends house to watch a couple of movies. We watched Pacific Rim and then Enders Game. I've recently read the book and was keen to see the movie and I enjoyed both. A small side note: Orson Scott Card is the author of the book and co-producer of the movie and I strongly disagree with his homophobic beliefs. Sometimes it is difficult to separate the work from the person and I did not want to financially support him. In this particular case I personally did not have to pay to read the book or watch the movie so have avoided the issue this time. From morning 'til night I was encapsulated in my own world playing a computer game, hubby was in another room doing the same thing and I think we only said about a dozen words to each the whole day! I have now had 2 ballet classes and I’m really enjoying them. It is deceptively hard work though. The movements we do are quite small, but deliberate and we repeat sequences a few times. We get to shake out our legs and arms before moving on to the next section and it’s surprising how much tension has built up. At first I thought it was just me because I’m quite out of shape but I looked around the room and all of us were reaching for our water bottles and towels to pat down our sweaty faces! Today we did a short sequence from Coppélia which the RBNZ will perform in Auckland in May. It was quite a lively piece and fun to try even if I did fall over my own feet a few times! We had quite a few more women in the class this week and one man. My class buddy who also goes to one of the evening classes says there are quite a few men at the evening classes. This really pleases me and helps counteract some of the gender policing nonsense I hear. My goal is to have a go at dancing en pointe and from what I have read, it will take at least a year of practice before I’m ready for that, maybe even much longer but it looks so beautiful I will give it my best shot.